NEW. 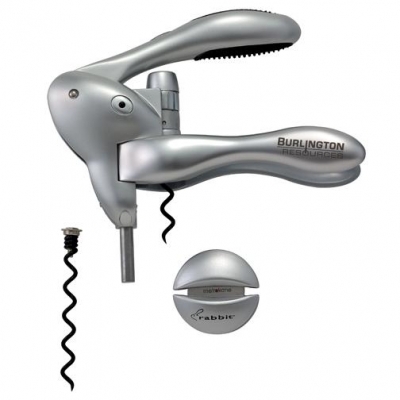 Rabbit Corkscrew that works in 3 seconds. Your corporate logo laser engraved on the handle. Minimum order with your IMPRINT is 24. Fast and user-friendly design. Removes the cork from a wine bottle in 3 seconds, and automatically releases the cork. Ergonomic design, and all gear teeth made of hardened metal. Includes a foil cutter and an extra spiral. Price Includes: Laser engraved imprint in one location. Packaging: Fashionable see-through lucite gift box. Options: Additional imprint location $2.00 plus setup charge. Setup $62.50 per location. Repeat order setup charge $30.00.